I loved this book. 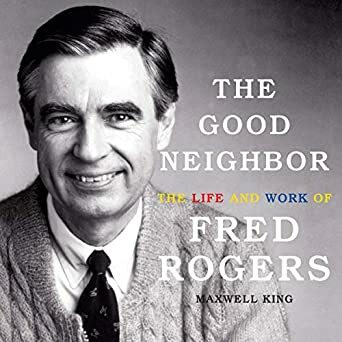 I learned so much about Fred Rogers that I didn’t know, from his childhood all the way to his death. I always thought he was an amazing man, but after listening to the audiobook I know he was so much more. The book is very detailed and you will learn how he turned a simple idea into a mega hit. He cared for everyone and wanted the best for them. Not just his friends & family. Everyone! He made each child feel special, that they mattered, and he truly cared for them. Rogers was the same soft spoken & loving man in real life that he was on tv. He was an inspiration to many people, especially a huge number of children. The world is a sadder place without him in it. The book is narrated by LeVar Burton who did a great job. If you are a fan or not, I urge you to read or listen to this book. With Levar Burton’s narration, I bet this was really special. I first got the print of this book but before I started it I saw Lavar Burton was the narrator of the audio so I got that too. It was great on audio! The show didn’t air where you live. It was a huge hit in the U.S. I loved his sweet, comforting show when I was a child. Vicki, this biography sounds WONDERFUL!! Okay now I need this book – especially in audio. I love LaVarr Burton and I love Fred Rogers. Mr. Rogers was one of the few shows I was allowed to watch as a kid and I adored it. Back when my youngest was little he got into a show called Daniel Tiger which was based on the original show and I did a bit of research to make sure it was sanctioned (it is!) and there was such a lovely quote by his widow about it and Mr. Rogers in general that I love him all the more. This sounds like a delight.